The majority of fruiting trees, as well as some ornamental trees, are grafted or budded on to particular rootstocks. 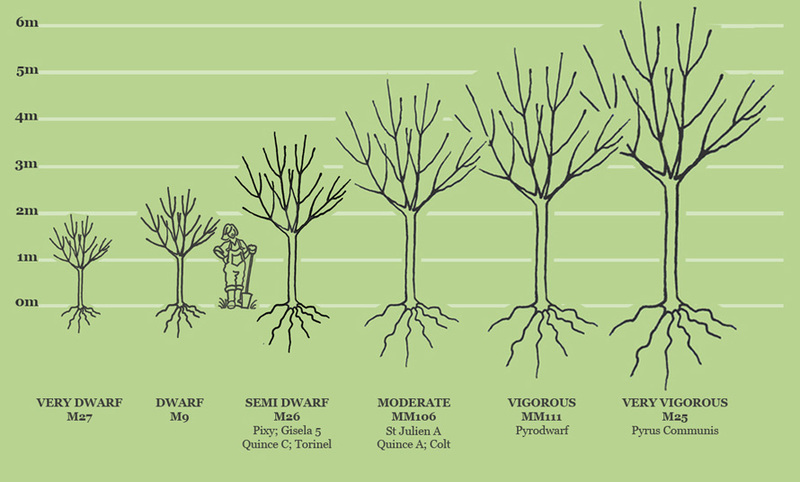 The rootstock determines overall vigour, ultimate tree size and potential yield. Soil types and location are also important factors in determining performance. Certain fruit tree rootstocks exhibit greater pest and disease resistance. Most trees require staking in the initial stages until well established. Fruit tree sizes and the rootstocks available from Carrob Growers. This rootstock is favoured for full standard trees in traditional orchards where stock may be grazed beneath the tree canopy and grass competes around the root zone. Vigorous rootstock. Suitable for half standard or full standard trees depending on the vigour of the particular variety. For traditional orchards. MM111 rootstock tolerates poorer soils or more extreme wet or dry soil conditions. Resistant to woolly aphid, collar rot and has good general disease resistance. Versatile, semi vigorous rootstock for most soils. On wet, colder clay soils, use as a substitute for M26 where it provides more vigour and greater tolerance to these conditions. Resistant to woolly aphid but some susceptibility to crown rot. Strong root system. Permanent staking only on exposed sites. Good for growing as bush forms, espaliers or fans. Very productive, semi dwarfing root stock for moderately fertile, well drained soils. Easy to grow. Fruits heavily from an early age, 3-5 yrs. Shows some susceptibility to crown rot and fire blight. Generally requires staking. Good for growing as bush forms, dwarf pyramids or cordons and even as fans where limited space is available. Dwarfing and productive root stock. Fruits from an early age. Relatively hardy and tolerant of wetter but not dry soils and requires moderately fertile soil to thrive. Weaker root system and requires staking throughout its life. Good for cordons or dwarf trained forms. Very dwarf rootstock for fertile, well drained soils. Little pruning required but may need some support. Useful for growing in containers, limited spaces and as step over forms. Semi dwarfing. Specific rootstock for apricots providing improved fruiting and fruit size as well as heavier yields. Ideal for trained trees. Semi vigorous root stock. Productive for bush forms of low vigour, half standards on lighter soils or trained forms. Now the favoured size for commercial orchards, garden planting or containers. Very productive from an early stage. Very vigorous root stock and suitable for standard trees and traditional orchards. Long lived and able to compete with a grass sward. Vigorous. Pyrodwarf rootstock is primarily used for perry pears but also useful for other varieties, producing robust healthy trees which fruit from a relatively young age. Semi dwarf. Good rootstock for bush trees, espaliers and fans. Tolerates a range of soils including heavier clay types. Strong root system. Easy to grow. Semi dwarf. Does best on moderately fertile and free draining soils when it will crop from a young age (3-5 years). Requires permanent staking. Ideal for cordons, dwarf trained forms and bush trees. Semi vigorous rootstock. Compatible stock for all plums, damsons, gages, apricots, peaches and nectarines. Heavy yields on a range of soil types but not for poorly drained ones. Used for half standards, bush or fan trained forms. Dwarfing rootstock. Pixy is ideal for size restriction in the garden and reasonably fertile soils. Productive from a young age but fruit size can be smaller. Requires permanent staking.